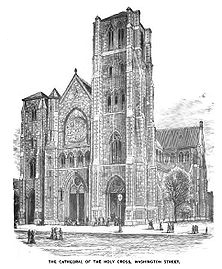 Ordination to the episcopate, priesthood, or diaconate is an event of great consequence in the life of the Catholic Church. The Sacrament of Holy Orders, which, like the other six Sacraments, was instituted directly by Jesus Christ, is paramount for the preaching of the Holy Gospel and the celebration of the Sacraments – indeed, for the continuation of the Church herself. 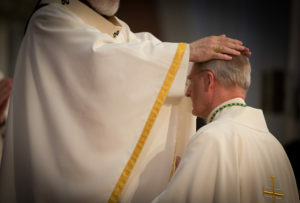 After the proclamation of the Gospel by one of the deacons, the actual ordination of a bishop begins. The hymn Veni, Creator Spiritus is chanted. Those to be ordained to the office of bishop are presented to the princip al consecrator. 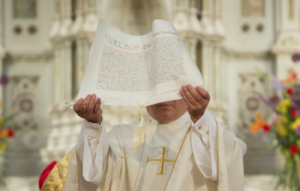 Then, the apostolic letter or mandate is read aloud. 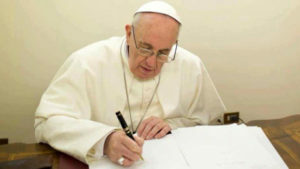 This letter testifies to the desire on the part of the Vicar of Christ that a man receive the third and final “degree” of the Sacrament of Holy Orders, namely, the episcopate. 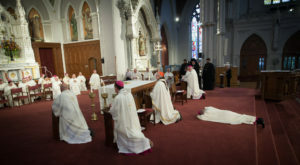 After the homily, important questions are asked of the bishops-elect by the principal consecrator, to ascertain whether the candidate is prepared to discharge this sacred duty until the end of his life, remaining “faithful and constant” in proclaiming the Holy Gospel, maintaining without change the “deposit of faith” that the apostles have passed along down through the ages, to “build up the Church as the Body of Christ,” and to “remain united to it within the Order of Bishops under the authority of the successor of the Apostle Peter,” praying unceasingly for the People of God. The Litany of the Saints is sung. The principal consecrator and the other bishops lay hands upon the heads of the bishops-elect. 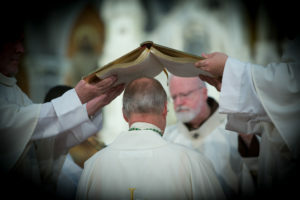 Then, the open Book of the Gospels is placed over the heads of the bishops-elect, while the principal consecrator offers the Prayer of Consecration, in part with all the consecrating bishops. The new bishops then take the first places among the concelebrating bishops. Before the Mass continues, the Rite of Ordination ends with the kiss of peace from the principal consecrator and all the other bishops who are present. 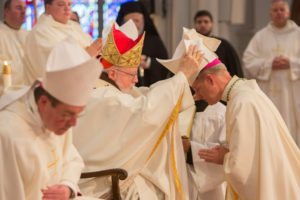 The Rite of Ordination of a Bishop illustrates the dignity of the office, the pastoral responsibility to which the bishop is called and the mercy of God Who continues to care for His Church by providing shepherds after the heart of His Son, Jesus.